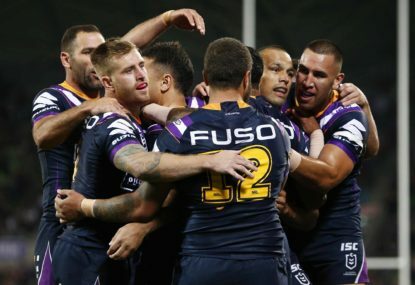 If the Melbourne Storm can play as poorly as they did in Townsville and still manage an 18-12 victory against a much-improved Cowboys side, I’m not sure who stops them from winning their fourth legitimate premiership. The Roosters will probably have the most to say in terms of disputing that line of thinking, yet a Melbourne team that dropped the ball consistently, failed to complete sets, and drove their intense and manic coach to the point of exasperation still managed to find their way through the mire and secure their fifth victory of the season. Frankly, there were moments where they were awful, perhaps preoccupied by the pending achievement of Cameron Smith and his inevitable eclipse of the all-time point-scoring record of Bulldogs great Hazem El Masri. That moment came early in the second half, after a penalty gifted the Storm two points and levelled the scores at eight apiece. Prior to the break, Melbourne’s errors had seen the home side build an 8-0 lead, before a late try to Will Chambers brought the visitors well within reach as the teams entered the sheds. After Smith’s record-breaking penalty, Josh Addo-Carr scored twice. One came from a stunning piece of ingenuity from Jahrome Hughes, who skipped away from dummy-half and laid on a try with a cleverly weighted kick into Addo-Carr’s corner. There was a late flourish from the home side and Ben Hampton did manage to score in the 73rd minute to set up a grandstand finish. In the final moments, North Queensland had opportunities to pull off a miracle, yet that is rarely achieved against the discipline of Craig Bellamy’s side – a discipline they rediscovered in the second half. It was another nail in the early-season coffin of Queensland football. The Cowboys plummeted to their fourth loss from five matches and the Brisbane Broncos did the same against the Wests Tigers at Suncorp Stadium. Thankfully the events on the Gold Coast in the earlier Friday night match saved some face for the Sunshine State. 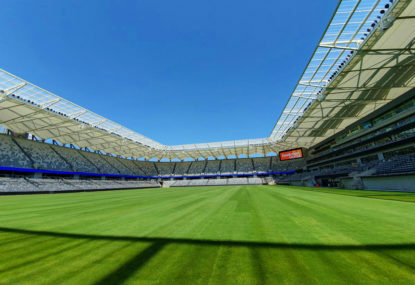 Even so, the three northern teams have just three wins between them from a combined 15 matches and, if not for the Bulldogs, the Queensland trio would occupy the bottom three rungs on the ladder. 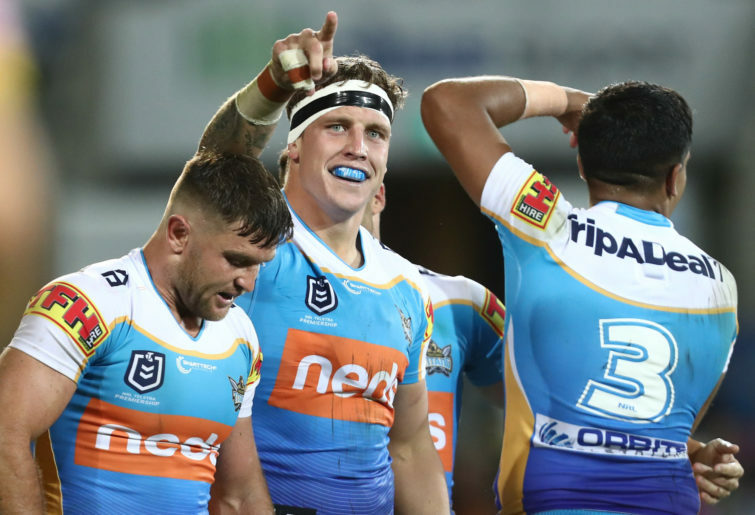 The Titans scrapped and scraped their way to a thrilling win over the Panthers at Cbus Super Stadium, snatching their first competition points of the season. To say the 30-24 victory was an attacking one, with defence as a secondary consideration, would be an understatement. Points flowed from the early stages and Garth Brennan’s boys looked more fluid throughout. Three first-half tries had the Titans in front at the break. Penrith managed two of their own, with Gold Coast errors under the high ball playing a key role in the 18-12 halftime score. Cleary Inc. appeared to click into gear early in the second half, with James Fisher-Harris and Josh Mansour crossing to establish an eight-point lead for the visitors, but the Titans were not to be denied. Jarrod Wallace and Bryce Cartwright crossed the stripe, the latter via a penalty try decision, as the home side held on grimly for their first win of the season. The two points fail to elevate Gold Coast above the bottom of the ladder at this stage, yet do provide some reward for a team that battled hard over the first month with key personnel on the bench. With those personnel back, they look more threatening. As for the Cowboys? It’s hard to tell. The forward pack is nowhere near the standard that many pre-season experts claimed it to be and the connectivity through the halves is somewhat lacking. 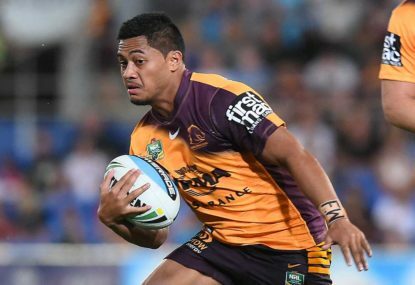 The Broncos looked terrible against the Tigers in terms of their shape and organisation. Curiously, the only team that Brisbane have muscled their way past this season is the Cowboys. Could it be that the three franchises north of the border accumulate the majority of their 2019 points from matches against each other? Stuart Thomas is a sports writer and educator who made the jump from Roar Guru to Expert in 2017. An ex-trainee professional golfer, his sporting passions are broad with particular interests in football, AFL and rugby league. His love of sport is only matched by his passion for gardening and self-sustainability. 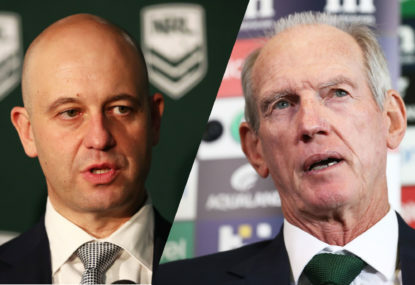 In 2018, the NRL pledged it would empower referees to enforce a penalty crackdown with a particular focus on repeated goal-line infringements and increased use of the sin bin. 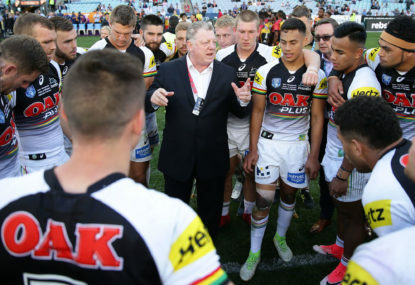 Outgoing Penrith general manager Phil Gould says it was his decision to step down and backed coach Ivan Cleary as the future of the NRL club. I’ve got a column in me about Israel Folau and all that. But the aftermath of Easter doesn’t seem the right time to write it and this probably isn’t the right place. The 2019 NRL season is in diapers, still only weeks old, and yet I’m already being forced into saying something that I know I’m going to get criticised for.